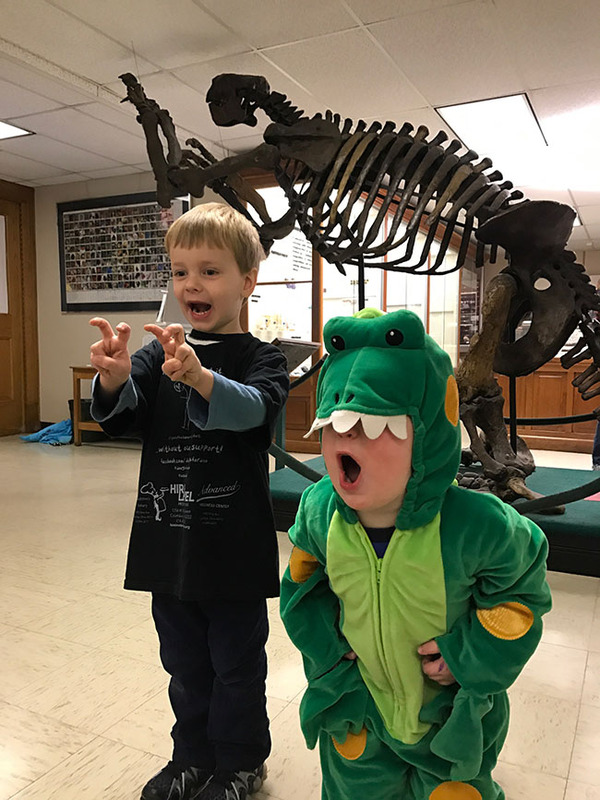 When local mom Erin Strouse was looking for a fun, affordable place to take her preschool-aged sons, a family friend recommended Ohio State's Orton Geological Museum. The Strouse family, Erin, Rob (MFA, 2010) and sons Garrett and Nathanael, quickly fell in love with not only the museum itself, but also the people in it. “What really caught our attention during our first visit to the museum was when we met Bill on our way out and he was so kind,” Strouse said. 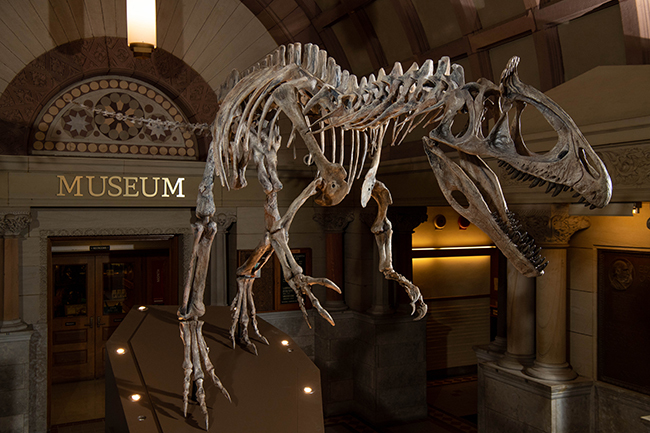 During that conversation with Museum Director Bill Ausich, the Strouse family learned of the museum's hopes of bringing a Cryolophosaurus cast to stand at its entrance. After learning of a crowdfunding campaign to raise the $80,000 needed to bring in the dinosaur cast, the family wanted to help their new friends at Orton. Originally, the Strouse family was looking for a small way to contribute to the fundraiser and created what they called the Dough for Dino campaign. By the end of the campaign, the Dough for Dino campaign raised more than $1,200 through the support of individual families, local businesses and several fundraising events. Strouse and her sons created a Facebook page a month before the university’s official crowdfunding campaign began and hoped to raise $100 to kick off the fundraiser and get the ball rolling for other donations. The family has been creating content for the Facebook page since Feb. 2017 when Dough for Dino was created until the dinosaur's arrival in Sept. 2018, and they're still posting content today! "Even though the dinosaur has been installed, we still want to help raise awareness about the museum and support its further renovations, research and outreach," Strouse said. The cast of Cryolophosaurus ellioti now towers over Orton Geological Museum. Strouse belongs to a mom’s club in Worthington that shares resources and organizes times to meet for playdates and field trips. She helped organize a field trip to the museum for the mom’s group and their children so other families could share the positive experiences that motivated the Strouse family’s desire to contribute to this campaign. Dough for Dino quickly became a community-led effort to raise funds as other families and local businesses jumped in to support. Strouse emphasized how integral her children were to this campaign by saying that all their campaign efforts were kid-centric and kid-fueled. As a former reporter for NBC4, Strouse was able to use her journalism background to pitch the Dough for Dino campaign as a human interest piece to local print and digital news stations to drum up support. Soon, video of Strouse’s sons and other children from the mom’s club all dressed in dinosaur outfits dancing around the Oval, raising funds with “sprinkle-saurus cookie” sales, and following museum curator Dale Gnidovec on a tour of the museum, were on the news raising awareness not only about the crowdfunding campaign, but about the Orton Geological Museum itself. Strouse children Garrett and Nathanael, now ages six and four, pose in front of a Megaloynx jeffersoni skeleton housed in the Orton Geological Museum. Gnidovec said the Strouse family’s support was invaluable to the fundraiser. “[The Strouse family’s] enthusiasm raised quite a bit of money and really increased the local visibility if the campaign,” he said. Gnidovec noted after the media coverage on the nightly news aired he’d have neighbors and local community members come up to him and mention how they contributed to the fundraiser after seeing the feature on television. These individual, community-driven donations were the heart and soul of the entire campaign. According to Gnidovec, they only received three donations over $1,000, so every individual donation mattered, and the visibility and energy the Strouse family brought was essential. After their successes, Strouse was able to coordinate a dinner for the community members who supported her family and the Dough for Dino campaign. She hoped to have the event at local Clintonville restaurant called The Crest because of the name’s unknowing association with the dinosaur they brought to Orton (the cryolophosaurus is known for its unusually shaped crest). The manager of The Crest happens to be a geology graduate of Ohio State and was happy to help Strouse. Strouse also invited Ohio State faculty member, David Elliot, who discovered the dinosaur, to attend the celebration. His attendance was a special treat to all the community members who took up this cause and helped bring his discovery to Ohio State’s campus, putting a fantastic ending to the Dough for Dino campaign.